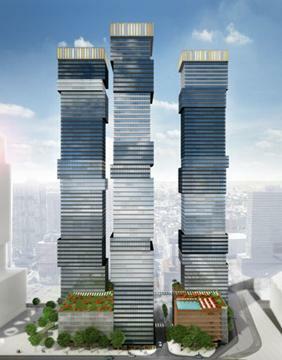 Status: Phase I: 69-story tower with 763 rental residences broke ground January, 2014. Ironstate Development Company and Mack-Cali Realty Corporation (NYSE: CLI) broke ground in January, 2014 on the first phase of this mixed-use development along the Jersey City waterfront. URL™ Harborside (Urban Ready Life™), a multi-phase development that will ultimately include three residential rental towers, ancillary retail space, and parking. It will add a vibrant housing component to Jersey City’s Harborside, Mack-Cali’s waterfront “city within a city” office complex. The first phase of the project will consist of a 69-story tower with 763 apartment units built on a parking pedestal. The URL® concept was developed by Ironstate president, David Barry, to provide people with innovative housing that maximizes space, reduces energy consumption, is more environmentally sustainable, offers close and easy access to public transportation, and provides public areas that foster community. Designed by acclaimed Dutch architecture firm, Concrete, URL® Harborside will be a flagship property with a distinctive tower reflective of its waterfront landscape.